Instantly find every occurrence of a word, phrase, function, variable, API, error code or anything else in your source code, with a single keystroke. Entrian Source Search is a search engine for your source code. It builds a full-text index of your files, and searches it instantly, giving syntax-colored results. It indexes everything, not just code, and includes powerful Fuzzy and Loose searching. 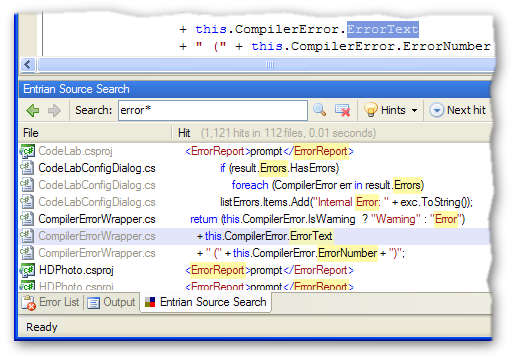 Search every­thing – not just code, but comments, strings, resources, documentation, notes, ChangeLogs, everything. Source Search goes way beyond a refactoring tool, or Find All References, finding important information in places other than just the source files in your solution. It's not just eye-candy – when your search results use the same color scheme as the source code in your editor, it's much easier for you to scan them. And glancing between the search results and the editor is less of a context switch for your brain. Not only does autocomplete save typing, it can often answer your question before you've even asked it: “What are the names of all the DROPEFFECTs we use?” And just like all Entrian Source Search features, it's both fast and unobtrusive.